Using a vegetable spiralizer, cut sweet potatoes, carrots, beetroot, and zucchini into spaghetti-like noodles. Add to a large bowl and season with salt and sugar. Let sit for approx. 5 min. Add olive oil, agave nectar, lime juice, tahini, and lime zest to a small bowl and season with salt and pepper to taste. Whisk to combine. Roughly chop hazelnuts. Add them to a frying pan with sesame seeds and toast over medium-high heat until fragrant and lightly browned. Remove from heat and let cool. 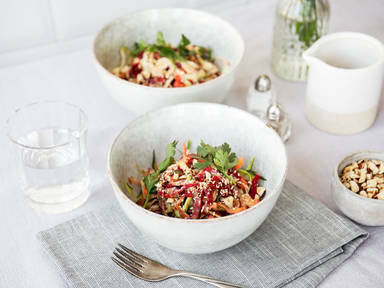 Serve salad with tahini dressing and sprinkle with toasted, chopped hazelnuts, sesame seeds, and parsley. Enjoy!